Easing Of Marijuana Laws Complicates Parents' Advice To Kids : Shots - Health News There are some warnings parents drill into their kids: no drinking, no smoking, don't do drugs. But now that two states have decriminalized recreational marijuana use, those conversations have become tougher. 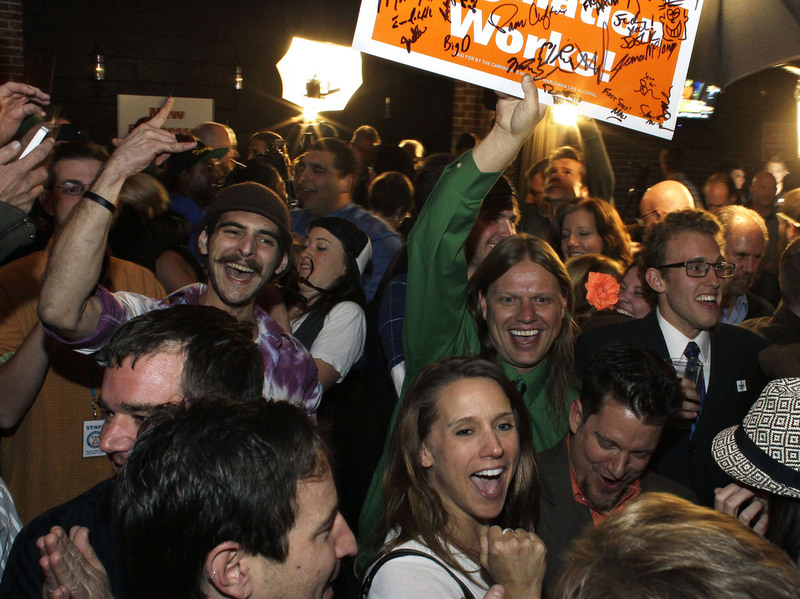 People at a Denver party early this month celebrate the recognition of an amendment to the Colorado constitution legalizing recreational use of marijuana. Parents drill certain warnings into their children: don't drink, don't smoke and don't do drugs. But those conversations have gotten tougher now that two states, Colorado and Washington, have decriminalized some recreational marijuana use. "Trying to explain this to my 9-year-old is hard," said Tami deBellis of Olympia, Wash. She's a mother who shared her thoughts with NPR's Tell Me More on Facebook. "I explained the benefits for some critically ill patients and adults if used legally. [It was] probably way above his grade level." But whether your child is 9 or 19, conversations about drugs are even more important to have now, says Dr. Leslie Walker, a pediatrician and chief of adolescent Medicine at Seattle Children's Hospital. She says marijuana is the No. 1 drug that sends teenagers to her substance abuse clinic. Dr. Walker that the drug potentially poses more risks to kids and teens because their brains are still developing. That could also leave them more vulnerable to addiction. "You put something like marijuana into the mix of a developing brain and, for some kids, it's going to be the first time they've had a drug that's going to cause lifelong addiction for them," says Dr. Walker. The smoke alone can have be harmful to young children. "If you wouldn't smoke cigarettes at home in front of your kids because you know of the dangers, you shouldn't think marijuana's going to be better," she says. Kids And Teens: Is Pot Bad If It's Legal? If parents use marijuana themselves, they should be careful about the example they're setting for their children. Dr. Walker says that using marijuana — even legally — in front of children can send a dangerous signal that drugs are the answer to stress. "'Mom's at home smoking some marijuana; it helps mellow her out.' Kids learn those messages, and those are very powerful messages." As more states discuss the pros and cons of legalizing marijuana, Dr. Walker hopes that young people don't get a distorted image about drug use. "It may seem like it, but the vast majority of kids are not using marijuana at this time. It'll be a natural experiment to see what happens over the next few years," she says.